Green Glue Noiseproofing Sealant is an acoustical caulk used to fill gaps between walls and floors and around electrical outlets, light fixtures, windows, and doors. Anywhere there is a break in building material, acoustical sealant should be applied to stop sound from traveling through an open gap. No special tools or skills necessary. 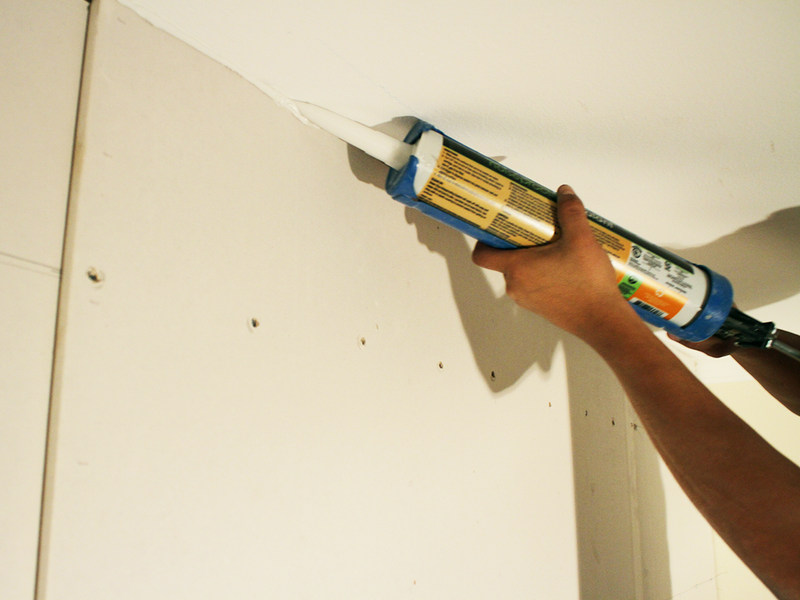 Apply with a standard caulking gun in the same manner as normal caulk. 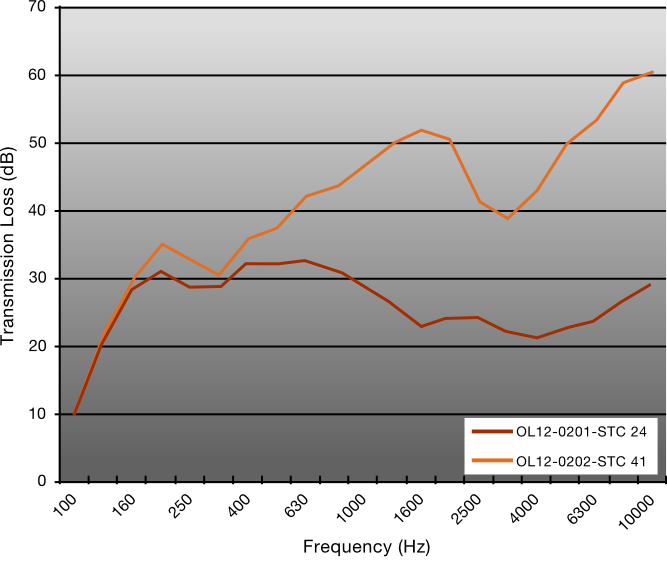 Green Glue Noiseproofing Sealant can reduce a project's noise transmission by 100 times or more. No soundproofing job is complete without it! Like cracks in armor, the best soundproofing strategy will fail if there are cracks and other gaps in a wall, floor or ceiling that are left uncovered. 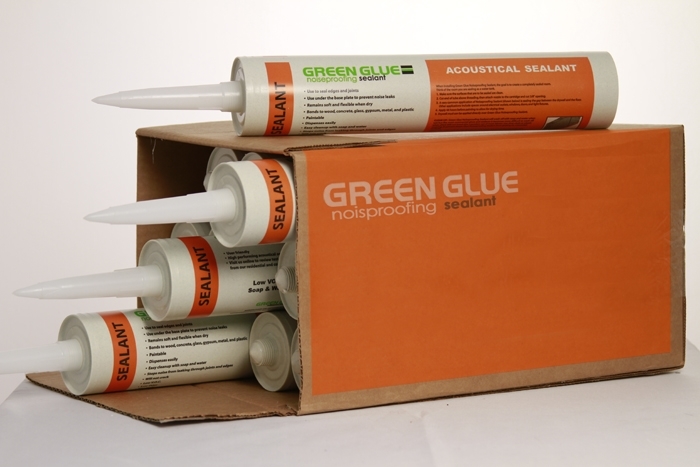 Green Glue Noiseproofing Sealant seals the cracks and gaps to prevent unwanted noise from escaping a room. It is non-hazardous, has practically no odor, and it resists drying out or cracking with age. • Apply with a standard (32-oz.) quart-size caulk gun. • Apply in the same manner as applying regular caulk. • While wet, Noiseproofing Sealant is easily cleaned with soap and water. • Intended for interior use only. • Not a finishing product; standard mud and tape should be used. • Allow to dry 48 hours before finishing or painting. Make sure all surfaces are dry and clean. Dust, dirt, moisture, etc. will prevent the acoustical caulk from bonding to the surface. Cut the tip of the tube to create an approximately 1/4" opening. Screw the nozzle on to the tip of the tube. Cut the tip of the nozzle to create an opening according to the size of the gap to be filled, not to exceed 3/8”. Secure the tube in the caulk gun. Pull the caulk gun trigger to dispense the acoustical sealant. Immediately clean any excess sealant and any tools used with soap and water.